It’s so cold today that it’s feeling hard to imagine a time when sitting out in the garden might become a reality again but summer will come and when it does I’d love to spend more time outside. Our patio could do with a bit of sprucing up to make it more welcoming, currently we have a few tired pots and a wooden table and chairs that are in various stages of repair so whilst we have a lot of space I’d feel a little embarrassed for anyone to see it as it looks right now. My Mum has one of the swinging chairs in her garden and whenever we go over there if it’s warm enough I just camp in. A chiminea because even in the summertime evenings are always chilly but I’d definitely sit outside longer if there was a source of heat. Where we live is incredibly peaceful considering it’s London and on a clear night I love to gaze up at the stars. Planters because we have very few areas to plant things in the garden which is currently quite overgrown with huge bushes which need trimming back. The industrial grey style means that the flowers once planted would do all the talking. The hurricane lanterns would add to the evening ambience and who doesn’t find candlelight relaxing? I’ve always wanted a water feature, however small. It’s hard to know what we’ll end up with once the garden is landscaped but something unobtrusive like this sphere would be ideal for now. And a large lounging sofa for guests and for me when I’ve had enough of the swinging chair. What do you have on your patio or to make your garden more welcoming? This is a collaborative post but all thoughts are my own. Images courtesy of the products. I am looking at re doing my garden this year, it needs a good re-vamp. I love those hurricane lamps, lovely curling up in the garden in the summer with the candles flickering in the dark. Roll on the summer! 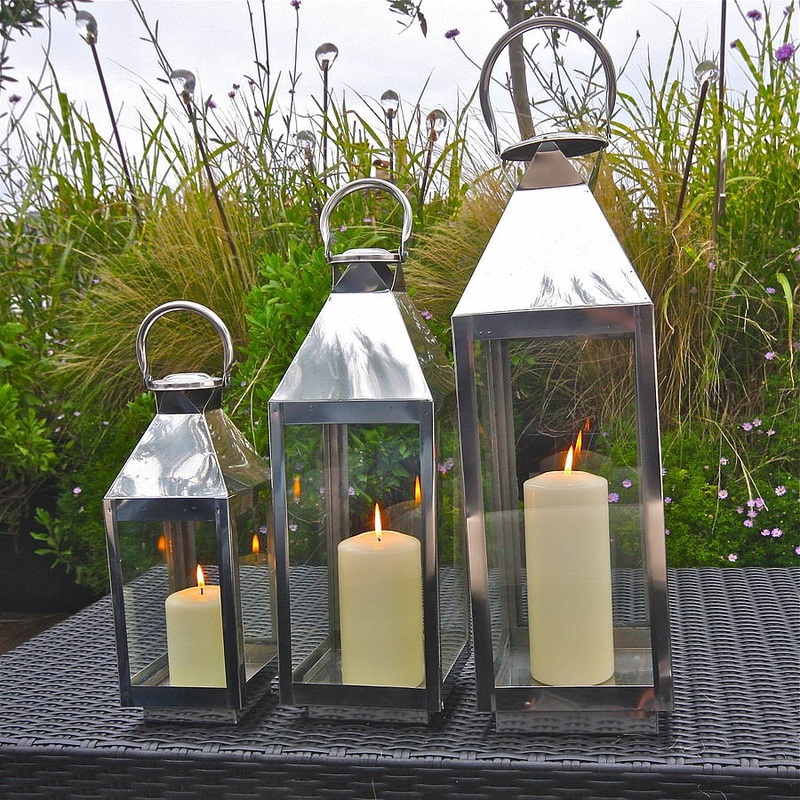 Lovely picks, I think we are all thinking to Summer evenings out in the garden at the moment. I certainly am. Very inspiring post this. We have a dreadful bit of patio out the back of our house. It’s only a small part of a much larger garden. I’d like to deck it and some of your suggestions would be ideal, especially the sofa and hurricane lanterns. I’d love some decking too, especially to try and stop the dog digging up the entire garden. Sadly my wishlist is too long and never-ending! Ah that’s a good tip to know, I’m the worst for leaving candles on when I shouldn’t! I just really want some warmer days now, where is spring? !